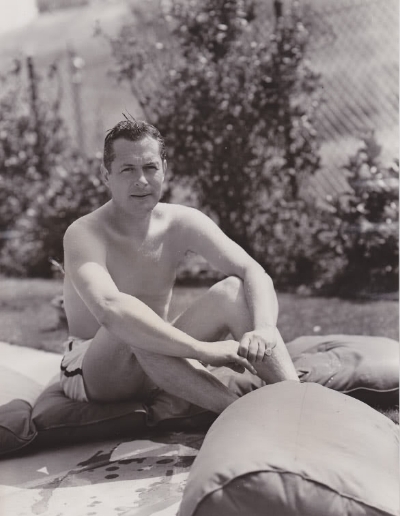 Yes, I seem to have a one track mind this week, I mean, besides dwelling on photos of Bob in swimming trunks! I'm just so, so tired of the heat here in Bakersfield. It's always hot here in the summer, but we are having a record-setting kind of year. We had ten straight 100+ days back in June, way too early for such nonsense. And the heat has been relentless ever since. An excessive heat warning is out for the entire holiday weekend. Bummer. Might be Thanksgiving before I can use my outdoor grill again! It appears, for the moment, that the 100s will continue through September 9th. We are on track for having the most 100+ days in a year since 1917. Oh, joy, what a momentous event in which to be a participant. One (Very) Long, (Very) Hot Summer! 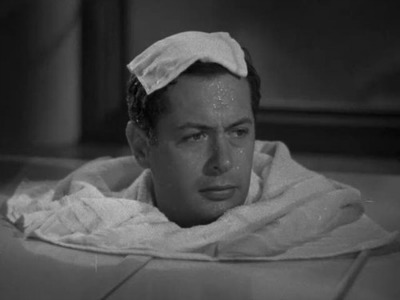 Taking a break while filming Love in the Rough (1930), Bob found one way to keep cool. 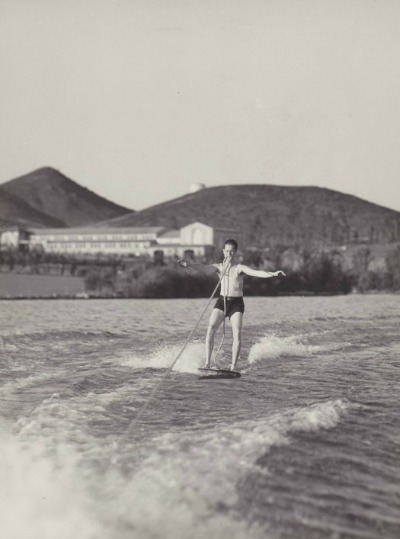 He is aquaplaning, a single board predecessor of water skiing. He appears to have hold of the rope with his mouth ... I think I'll stay with your basic splashing in the pool. Meet Me in the Casbah --- Oh Yes, Yes!! 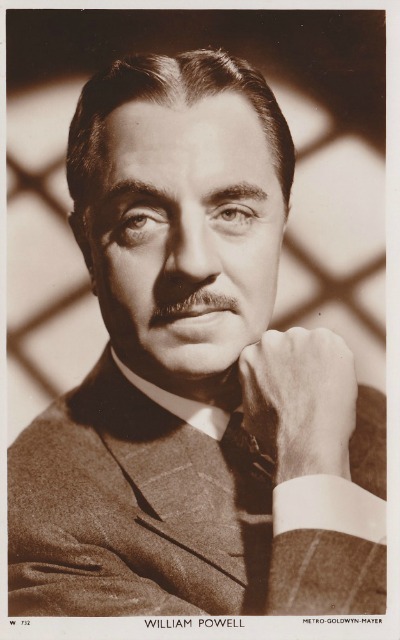 Charles Boyer was one of my early favorite movie stars. The combination of his voice and accent ... just heavenly. He was always telling these beautiful women that he loved them and, needless to say, I always imagined I was the lucky lady in his arms. However, Mr. Boyer was totally unavailable. 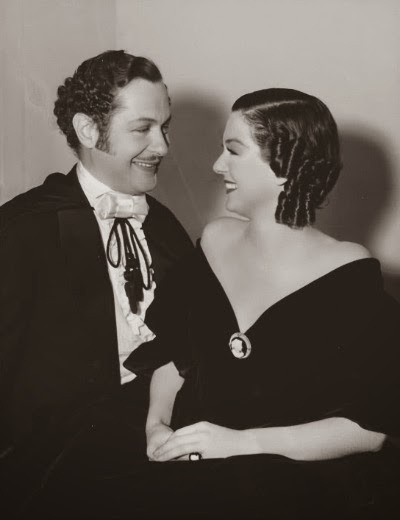 He married his wife Pat in 1934 and, by all accounts and unlike most of his compatriots, remained faithful to her until her death on August 24, 1978. Two days later, Mr. Boyer committed suicide rather than continue to live without her. That was August 26th, two days before his birthday of August 28th. It's all so sad, but being with the love of your life for 44 years, that part of it was a wonderful blessing. And just what was Bob doing 61 years ago today, you ask? 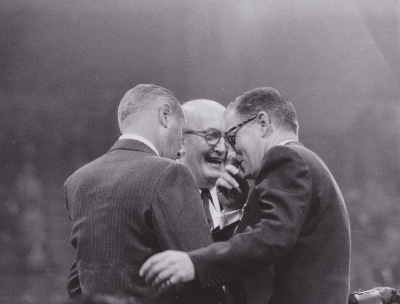 Why he was at the 1956 GOP Convention held in San Francisco, Calif. If President Dwight D. Eisenhower was giving a nationally televised speech, Bob was always there to make sure everything was done properly. One really has to admire Bob for his great sense of civic duty. Four years of active military service in WWII, when he was well over draft age and could easily have limited his time served to a few U.S.O. tours ... that was a big one. And then to follow that up with serving as Ike's media advisor for seven years for the princely sum of $1 a year ... that's impressive. Granted, it looked good on his resume and Bob was not meek about letting people know about his association with the President. But he earned the publicity. Two and three flights a week between NYC and DC were often required. He was simply there for the President whenever needed for all those years while never once violating Ike's trust re privacy and national security. Considering what goes on these days ... the man was a saint! I just love the fan magazines of the early 1930s. Photoplay Magazine was one, if not the best of its kind in the 1930s. Richly done, great photos of the stars and, appropriately, on the expensive side for collectors. 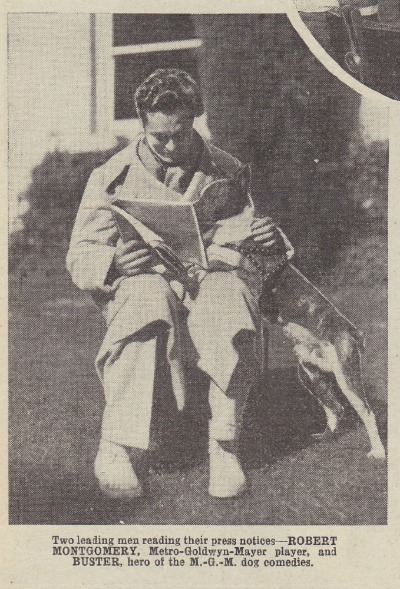 In Britain, there were two highly successful magazines which covered U.S. movies, as well as their own. I'm guessing Picturergoer was No. 1, with Picture Show not far behind. Bob made the cover of both several times, and I snarf them up whenever they show up for sale. I wish they had provided the kind of bread he liked, which dressing he used. I mean, there are so many unknown things about Bob we will never know, and now there are even more. Sigh. Ann Blyth was born August 16, 1928, making her 89 as of tomorrow. 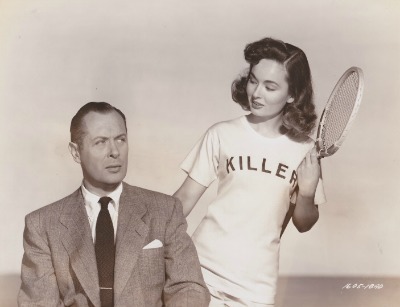 The last of Bob's ladies, I'm sure we all extend our heartfelt appreciation for her delightful performance as "Killer" in Once More, My Darling (1949). Once Killer set her sights on Collie (Bob), he didn't stand a chance. Six Bob Movies for August ... More, More, More! There are six Bob movies being shown this month on TCM! Great. It's TCM's Summer Under the Stars month and five of Bob's co-stars are featured. The first movie is They Were Expendable (1945), being shown on John Wayne's day this Saturday. The other five are not shown nearly as often, so here is your chance to see/record a few of his other movies. I just checked the IMDB ratings. Kinda interesting. I have always had a difficult time objectively rating Mr. Montgomery's movies, but these ratings seem "close" to my viewpoint. They Were Expendable is simply a great picture, I'd have it at the top of the list, knocking Blondie down to 3rd place. I can see The Gallant Hours not being for everyone, but still, a good movie. Trouble for Two should have a slightly higher rating, maybe kick it up to 6.9. Bob and Roz are just so good together. Biography... alas, is rated about right. Between the heavy-handed censoring and Bob being miscast ... I'm not sure I have even watched it all the way through. Whoa ... One Too Many!! It has been a while since I had some celebratory champagne. It may be a while before I have some more. Best write up my post tomorrow. Yeah, an excellent idea. Sharing a sauna with Mr. Montgomery, even better! And What Do Ann, Irene, Dorothy and Norma All Have in Common, Besides Bob? Okay ... four of Bob's ladies have birthdays this week. Ann Harding and Irene Purcell share the 7th. Dorothy Jordan's is the 9th and Norma Shearer's day is the 10th. Well, one big Happy Birthday wish goes out to all four of you delightful ladies. 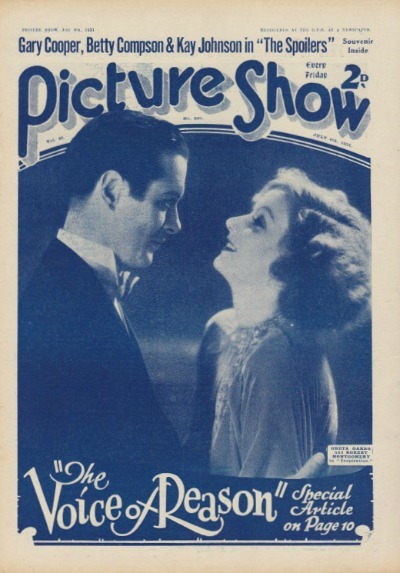 Just noticed Bob starred with Dorothy, Irene and Norma in 1931. Wonder whose birthday invitation Bob would have accepted if he could attend only one party. Ha. Like he could have said no to a summons by Ms. Shearer. Then too, in 1931 he would have found a way to attend all three parties!! 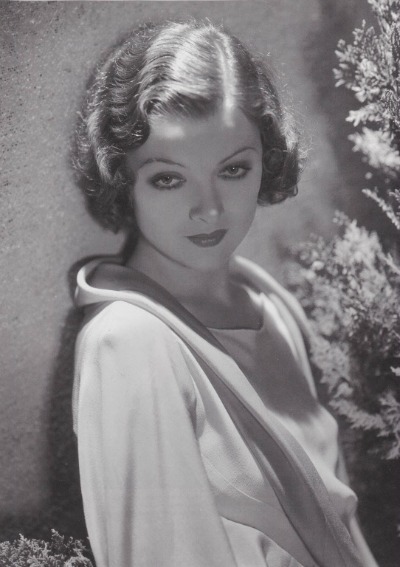 I hate to pass up on a chance to use one of my Bob/Dorothy photos, there are so many great ones. Such a good-looking couple. The word beautiful does not come to mind first when I think of Ms. Jordan. Cute does, she was so amazingly cute. Beautiful comes to mind more often when I think of young Mr. Montgomery. So, who do you think had more natural curls? The opening scene of Riptide (1934), wherein Herbert Marshall appears in a rather amazing "bug" costume, is, well, on the bizarre side. But it is funny. 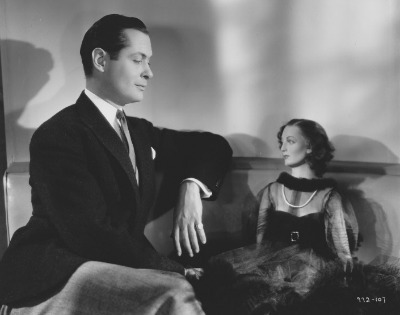 The Last of Mrs. Cheyney (1937), has its own bizarre sequence. Everyone is at a charity auction and a fierce bidding takes place for a doll with an almost spooky likeness of Mrs. Cheyney, Ms. Crawford, of course. Now, I am not sure what adults do with lifelike dolls, for the most part, but Lord Dilling (Dill/Bob) is the winner, as seen here observing his new treasure. Makes me shudder a bit. **Maybe not from trying. Actually, in 1937 it would more likely have been Norma Shearer!